When a wave of popular uprisings known as Arab Spring erupted throughout the Middle East in early 2011, the world witnessed not only the drama of political revolution but also the struggle for cultural expression. As nonviolent protestors gathered together, public spaces like Tahrir Square in Cairo became stages upon which the Arab people demonstrated their power and performed their resistance. Revolutions can be read as performance and analyzed in theatrical terms, with a focus on the passive, subjugated bodies rebelling against the power structures that constrain them. Each revolting body renounces both its safety and its individuality in order to yield a larger, collective entity: “The People.” In Arabic, the word for “people” is singular, thus capturing the dynamic process by which multiple actors converge into a unitary force that demands drastic political change. While ruling governments in Egypt, Tunisia, Libya, and Yemen were deposed as a consequence of the uprisings, the al-Asad regime responded with unparalleled violence, unleashing an intractable civil war that has displaced millions of Syrians and continues to devastate the country. During the uprisings, hundreds of unarmed civilians were incarcerated, tortured, or killed and journalists were blocked from the country. But in a time when everyone keeps a recording device in their pockets, repressive regimes have a much harder time silencing those who would bear witness to institutional abuses. The result is a cinema of resistance, the creation of a vast, disorganized, popular, and free archive of revolutionary acts that have been recorded and uploaded to the Internet. The transmission of these fragmented videos, messages, and images through social media has been the main tool for spreading information that counters official discourses and encourages further action on the streets. Mirroring this convergence of digital artistic responses to the revolution were performances and exhibitions that took place mere days after the first protests occurred. Dalia Basiouny’s Tahrir Stories, for example, premièred on February 23, 2011. The immediacy of such cultural metabolization raises important questions about timing and historicization. Is it possible to produce art about a historic event at the very moment in which the event is taking place? Or does the act of producing an art piece unavoidably mark the end of the event? Is it necessary to gain historical distance in order to respond artistically to a revolution? 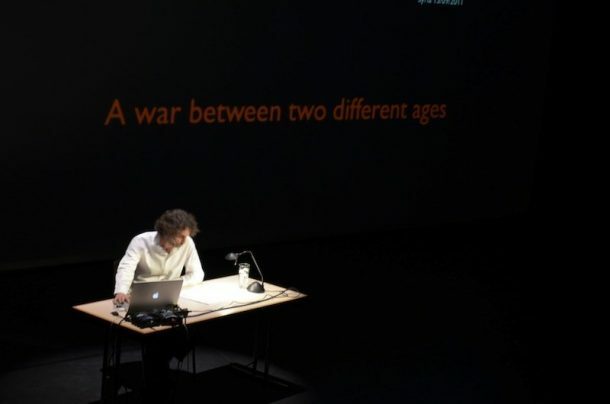 And how has the extensive use of portable, hyper-connected and ultra-fast recording systems influenced the process of historicization, or the borders between performance and reality? If the artwork is created while the events are unfolding or soon after, before adequate historical distance has been gained, does it lose its artistic signifier and turn into a piece of journalism? Does it become part of the demonstration itself? Does an artistic response to a revolution that transcends activism become an act of memorialization that positions the revolution in the past and marks its end? And how have the new forms of creativity and the ubiquitous presence of recording devices influenced the act of memorialization? In his 2012 one-man show The Pixelated Revolution, Lebanese multidisciplinary artist, Rabih Mroué, engages with some of these issues by blurring the frontiers between artistic product and political activism, sharing and analyzing videos of the revolution recorded by civilians during the 2011 protests in Syria, and theorizing the philosophical and practical implications of using cameras as weapons against oppression. Although Mroué has claimed that art that reacts to political events in an activist manner is not art, his work is nevertheless highly political and was immediately influenced by the revolution. As the Arab Spring was expanding and unfolding, Mroué’s first solo exhibition, “I, the Undersigned,” was showing in several European venues. Its title evolved to, “I, the Undersigned The People are Demanding,” with the original title crossed out with red graffiti spray and, “The People are Demanding,” sprayed in Arabic, then finally to, “Will the Spring Visit Us?” The evolution in the name of Mroué’s exhibition parallels the evolution of the Arab Spring, representing an act of suppression of the individual (I) in order to embrace the collective identity (“The People”). Mroué himself recognized this embeddedness, arguing that when the revolutions began, it became clear to him that he could not continue to create art exhibitions as if nothing was happening. Prior to The Pixelated Revolution, Mroué had explored in his works various aspects of the image, including its manipulation for political purposes, the fabrication of truth through editing and the way in which image relates to the construction of time and memory. For example, in Three Posters (2004) he compared the different versions of a video in which a suicide bomber announces his action and how they differ from a final edited product in which all signs of hesitation are erased. To prepare the audience for analyzing the various versions with emotional detachment, the show starts with three similar videos in which Mroué himself plays the suicide bomber. By uncovering the part of the stage on which the videos are being recorded on a set and revealing that the videos are fake and that the artist is the suicide bomber, Mroué suggests how easy it is to manipulate images to convey a specific ideological message and allows the audience to analyze the real videos more coldly. Continuing Mroué’s engagement with this idea, The Pixelated Revolution is a monologue that discusses videos of the revolution recorded by civilians during the protests in Syria. Mroué challenges the compartmentalization of art into distinct disciplines, identifying himself simultaneously as a theatre director, playwright, actor, and visual and performance artist. 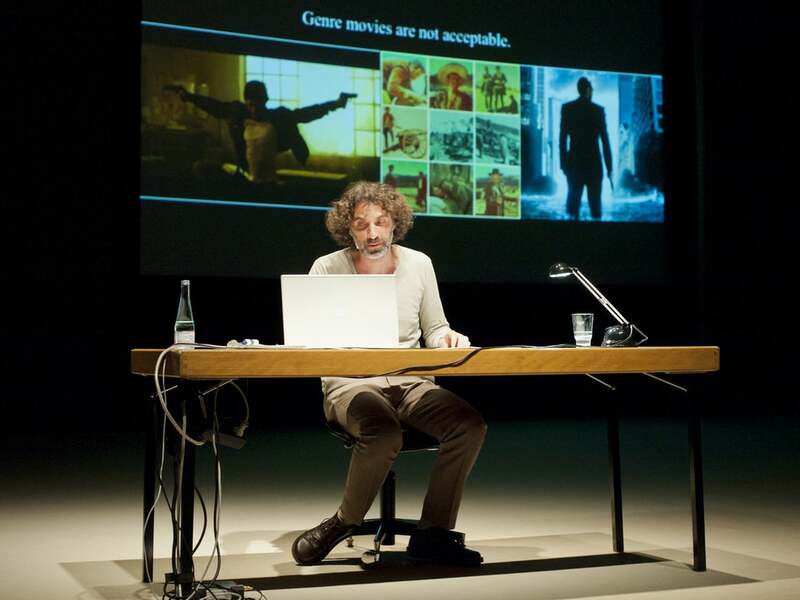 He appears on stage as the only actor, sitting behind a desk with a lamp and a laptop, and reading from a script that lies on the table surface. He faces the audience and addresses them directly, breaking the fourth wall. At the back of the stage, several videos and texts are projected onto a large screen. The piece is divided into an introduction and seven sections with individual titles, each of which develops a personal interpretation or idea about the act of recording the shooting of civilians by official forces during the Syrian protests. In the first two sections, “Dogma 95 in Syria” and “The List,” Mroué creates a set of rules to record the revolution, combining Lars Von Trier and Thomas Vintenberg’s, “Vow of Chastity,” with the advice shared on social media by activists. In the three central sections (“Double Shooting,” “The Eye,” and “The Tripods,”) Mroué develops what I consider to be the most brilliant ideas of the piece: the camera as a physical eye of the protester, the use of the camera as a weapon and the necessity of recording low quality pixelated videos as part of the revolution. Finally, the sections “The Tank,” and “Image Until Victory?” close the piece and argue that the revolution is not Islamic in nature and that images alone will not win the fight. The introduction immediately establishes the language and tonality of the piece. Mroué announces that he will show pixelated and low-resolution videos alongside some professional films and videos in order to analyze and compare them with objectivity and thus better understand the Syrian videos from a position removed from emotions and immediate reactions. He addresses the audience openly and simply, asking them to observe critically, explaining his intentions and unpacking his creative process. No apparent distance exists between the real person and the character, between author and actor, until his poeticized language and unique interpretations reveal the artistic value and dramatic intentions of the piece. The first section, “Dogme 95 in Syria,” references the film movement launched by Lars von Trier and Thomas Vinterberg in 1995 which advocated for a purer form of cinema on the anniversary of the invention of cinema. Dogme 95 included a manifesto and a “Vow of Chastity” with specific rules to follow when making a film. Mroué draws a connection between the language used by these filmmakers and the recommendations posted in social media by Arab activists on how to more effectively record the protests and the abuses of power taking place. Mroué collected many of those recommendations and combined them with directions taken from Dogme 95’s “Vow of Chastity” to create a fictional list of recommendations and directions on how to film events like demonstrations. Mroué further develops this idea of the recording device as a new eye for activists in the subsequent section, “The Eye.” Since protestors are viewing reality through a mobile phone that has virtually become part of their bodies, “their cameras are not cameras, but eyes implanted in their hands.” With a new unexpected connection, Mroué analyzes the function of those implanted eyes in the light of the ideas proposed by the nineteenth-century medical field of optography, which studied the possibility of extracting from the retina the image last seen by the eye of a dead person. Several doctors experimented with the possibility of discovering the image of the murderer recorded in the eye of the victim. In the Syrian video, the phone serves as the retina of the dead activist, encapsulating the memory of his last vision: the face of his killer. Meanwhile, the activists do not flee the danger and escape their death, even though they have time to run; instead, they insist on continuing to record the scene. Although unclear why, a plausible explanation lies in the apparent protection afforded when standing behind a camera lens. Within the limits of that enclosed reality, the recorder cannot fully grasp that he also occupies the same space as the sniper, “[t]his is why the Syrian cameraman believes that he will not be killed: his death is happening outside the image.” Furthermore, the cameraman can more easily disregard the precariousness of his existence when his sole objective is to see and record the sniper’s eyes. The possibility that these images can reveal not only the identity of the killer but also the image of the victim within the eye of the killer is further explored in Mroué’s Shooting Images (2012). In this performative video reenactment of a similar situation, we see a sniper at the top of a building aiming and shooting at the camera that falls to the ground after the shot. The scene is deconstructed in several ways, shown in extreme slow motion, without sound, then zooming into the eye of the sniper to reveal a hidden image of the cameraman recording with his cell phone. To the surprise of the audience, the cameraman is Mroué himself. After discussing images of the revolution more generally, Mroué stops to closely analyze a second video in the section entitled “The Tank.” The video, unfortunately no longer available on YouTube, is only 14 seconds long but is extremely disturbing, as it shows a tank driving slowly, stopping, pointing its nozzle towards the camera and shooting. The camera falls to the ground and the video ends abruptly. Like the first main video of the show, in which a sniper shoots at the camera that has spotted him, this one also shows a person recording a violent act against himself, although in this case we do not hear the voice of the person recording, which makes it seem more likely that he died. Another difference is that the killer is inside the tank and therefore, the camera cannot record his eyes. Mroué connects the tank video to a scene on Elia Suleiman’s film, The Time that Remains, that shows a tank, a man walking on the street and the camera watching. The tank is first pointing at the man who walks, but after he leaves, the nozzle turns towards the camera, the witness, the spectator. Up to this point, both videos have clear resemblances, but the movie scene continues to change the point of view of the observer, as the camera now is in the tank pointing at the witness that we have not seen yet. By contrast, in the Syrian videos we only see one point of view, that of the victim’s and for that reason, we never see their faces. We only hear their voices in some cases. 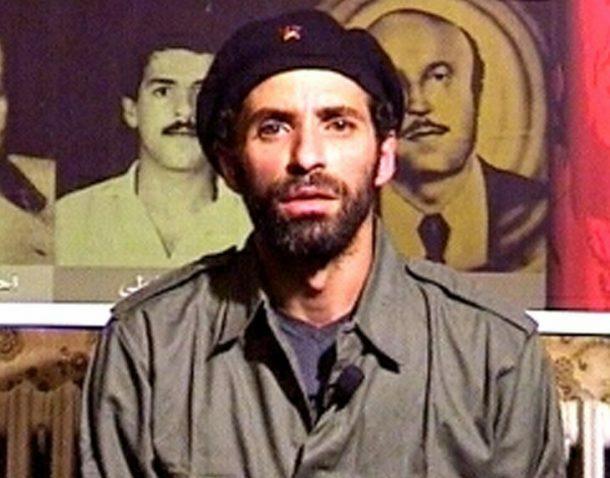 Are these anonymous men martyrs of the revolution, fighters or filmmakers? Their videos are, at the same time, the virtual counter-weapon for the soldier’s real fire weapons and their testaments. After exploring so deeply in the previous sections the various facets of imagery, Mroué ultimately concludes that images will not be enough to win the battle against repressive powers in his final section, “Image Until Victory?”. Despite acknowledging the importance of the videos as weapons against oppression as well as the bravery of those recording them, Mroué believes that they are inadequate as a long-term means to win the war or to transform the political situation. He ends The Pixelated Revolution with the words, “I think that the Syrians are quite aware, unlike some of us, that images alone are not enough to achieve victory,” leaving the piece open to reflections about what else is needed to achieve victory. The second argument of this last section is that the Syrian revolution is not an Islamist one, since videos depict protestors who insist on showing the faces of their killers to prove that “death is not solely in the hands of God (Allah).” Rather, death has been inflicted by clearly identifiable actors who kill innocent civilians for political reasons. Thus, Mroué sees these videos as proof of the secular aspects of the revolution. As seen by the multiple layers and the blurring between actor and performer, shooter and shot, The Pixelated Revolution is hard to categorize. Rabih Mroué refers to it as a “non-academic lecture” and as “my presentation.” On the most basic level, those terms certainly apply; but when one contemplates the piece further, a myriad of other characterizations emerge: a video installation, a performance, a theatrical monologue, a documentary theatre piece. The basic elements of theatre are present: there is a text, a space with props, an actor and an audience, but this combination of lecture, performance and homage is successfully utilized by Mroué in an innovative, alternative way of viewing and theorizing images. Although Mroué is alone on stage, the projection screen is a second presence, an open window to the world that connects the actor with the past and brings his discourse to life. The projector screen is constantly used throughout the show to display not only videos but also images of Mroué’s own research on the Internet, the screen of the computer with Facebook pages in Arabic, the pages of Dogme 95 or specific questions or sentences from the presentation. Only the two aforementioned main videos (of the tank and of a sniper shooting at the camera holder) are closely analyzed and played frame by frame, but Mroué shows many other videos recorded by Syrian protestors. His words are accompanied by images of people running and sounds of gunfire, a man staying behind and throwing rocks at the invisible chasers and then falling to the ground (dead? ), the feet of a cameraman running and the ground before him, people peacefully demonstrating, a man on the floor covering his face as he is kicked by various legs. Mroué stresses the importance of the fragmentary, pixelated, and shaky quality of these videos. In both the nature and the content of their communication, they are the weapons of the revolution. Mara Valderrama is pursuing her PhD in Theatre at The Graduate Center at City University of New York (CUNY). She is the regional managing editor for Spain at The Theatre Times, and she teaches Communication at Baruch College. She holds MA degrees in Theatre and Performance Arts and in Comparative Literature from the Complutense University in Madrid.